The Malaysia Map below shows the geographical location of this nation with respect to her neighbouring countries. The North of Peninsular Malaysia is the nation of Thailand and to the South is the nation of Singapore. 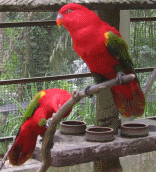 East Malaysia consists of the states of Sabah and Sarawak on the island of Borneo. 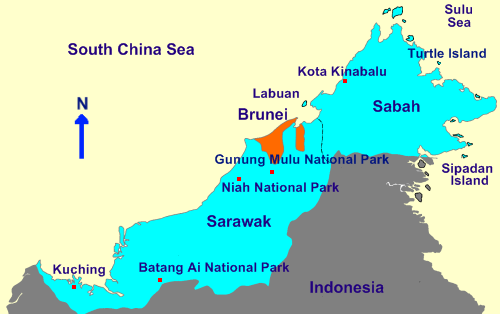 The oil rich nation of Brunei borders the state of Sarawak. Kalimantan of Indonesia is located to the south of this two states. Use the interactive map below to navigate to the state of your choice. It will lead you to a more detailed write-up on the places of interest and other essential information. Equatorial Climate with temperature ranging from 21 °C to 31 °C in major cities. On the highlands, the temperature is cooler and ranges from 16 °C to 24 °C. One can choose to escape the heat of the cities by going up the highlands, driving journey time ranges from 1 hour to 3 hours depending on which highland you go to. Latitude of Kuala Lumpur is about 3 ° North of the Equator. Longitude of Kuala Lumpur is about 101 ° East. Enjoy the sunshine throughout the year. Malaysia has one standardised time zone which is Greenwich Mean Time + 8 hours. Malaysia consists of 13 states and 3 federal territories. 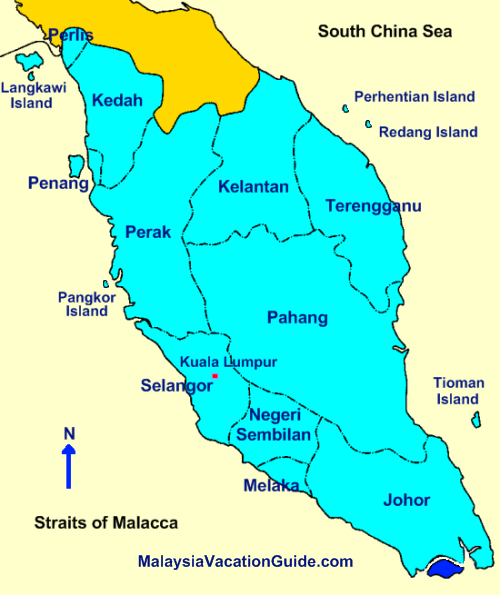 Peninsular Malaysia consists of 11 states and 2 federal territories. The 11 states are Perlis, Kedah, Penang, Perak, Selangor, Negeri Sembilan, Malacca, Johore, Kelantan, Terengganu and Pahang. The 2 federal territories are Kuala Lumpur, the capital of Malaysia and Putrajaya, the federal administrative capital. 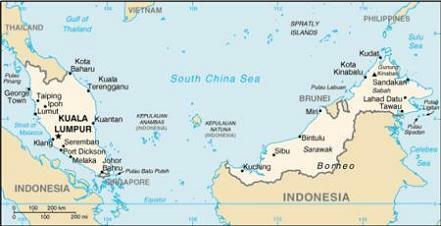 East Malaysia consists of 2 states and 1 federal territories. The 2 states are Sabah and Sarawak. Labuan is the one and only federal territory in East Malaysia. The 2006 population of Malaysia is estimated to be in the region of 26 millions. There are still plenty of room to accommodate visitors. The official language of Malaysia is the Malay Language. However, English language is widely spoken. Other languages and dialects used are Mandarin, Tamil, Hokkien and Cantonese. In other words, you will not get lost in Malaysia. The main gateway to Malaysia is through the international airports such as the KLIA, LCCT, Penang, Kuching, Kota Kinabalu and Langkawi.